What was that last year then? Joerger gave him carte blanche to try and develop his offensive skillset and he reeked. I want no part of trying to bring out "offensive superstar" WCS a second time, especially since he tends to lose sight of the things he can (but doesn't) do well. Would these aforementioned secret skills by any chance include some touch around the basket? He doesn't take advantage of everything he actually DOES have. He'd easily be a $100 million player if he committed himself to being a super-charged version of Capela/Tyson Chandler, etc. But he obviously has no interest in doing so as he's shown in his play and his comments over the years. Those dudes became vital foundational pieces to championship contenders because they committed to being defensive anchors, rebounding the ball and only taking highly efficient, positive outcome shots on offense. I'm out. Thought maybe I'd be interested if we could get him back $10mil or lower, but nah. We should be committing to our 2 foundation pieces in Harry and Marvin and building a bigs rotation around them, rather than trying to keep fitting WCS into the picture. Commit to Harry starting next season, even if that only means 25 MPG, and go get 1 of the absolute plethora of quality bigs who fit this team like a glove. Just so many different options we can spend the money we'd pay him that would make us a much better team going forward. Extend WCS... Let them play next year and see if we see the kind of improvement we saw this year. Start Bagley III next to him as PW. Keep Barnes, and start him at SF, with Hield, and Fox that's one of the best starting lineups in the league, and if they were firing on all cylinders then there is no team in the league we cannot beat. I don't want to make drastic moves unless I know that the guy coming in wouldn't mess up the chemistry the team has. Playoff team will pay WCS nowhere near 4/70. In addition, all of them would not waste their time for over 10-12 mil. Now, if you’re raking bottom feeder teams that have pee poor FO’s he may entertain a little higher. If the Kings FO are dumb enough to offer him 4/70, the team will continue to be the laughing stock of the NBA. It sure would be nice if Kings could get something back of value for WCS. A sign and trade hopefully. Thinking this ship sailed at the trade deadline. Dont think sign and trades happen with the lower rung Restricted FA no? You don’t see sign and trade deals for MLE type players. WCS is gone and I am fine with that. I can see him becoming a real drag on the chemistry when Bagley and Giles start getting more playing time next season. When he doesnt get the big contract he expects he will blame the kings for not giving him the "opportunity" like they did for Bagley or Knicks did for Porz. He believes the only reason he isnt a superstar offensive player is due to lack of being the go to player. So he will have a grudge against the kings for that, then it will be a double whammy as he gets pushed to the bench in favor of bagley and giles. I agree with that. Not totally sure though about the MLE part, which begs the question. This is where I think Vlade needs to shape the roster in a way that force Joeger to start Bagley next year. I think a lot of Joeger's refusal to start Bagley was because WCS and Bagley games don't mesh in a run and gun team. WCS total lack of a 3 point shot prevents Joeger from inserting Bagley into the starting line up. Since Bagley's 3 point game is still evloving and WCS is non-existent, Joeger goes with WCS because of experience and defense. To get Bagley into the starting line up next year, the Kings need to get a legitimate stretch 4 or 5 to start opposite Bagley. The ones I think the Kings have a legitimate chance of getting in the summer is Brook Lopez (Stretch 5) or Nikola Miortic (Stretch 4). Lopez would be most ideal because he is also a rim protector and is a Central California (Fresno) guy. 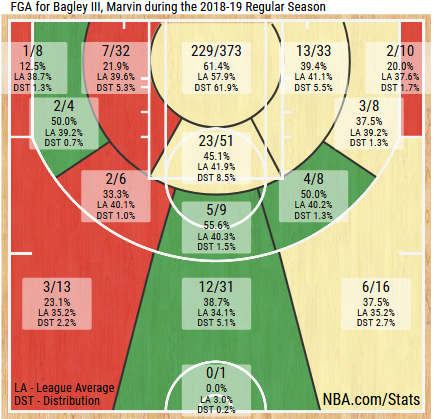 Ok I decided to take a look at a few shooting charts for spacing, assuming Bagley starts next season, and Giles plays a decent amount of minutes too. So for spacing purposes the left side of the chart beyond 3, same side elbow would be a good place to have our other big. Now take a loot at Vucevic shot chart. He is hot right where we want him at 3 pt depth to maximize spacing. Also fantastic on that side of the floor. Now when you look at Harry, who is a dangerous passer, he's not very efficient unless close to the basket. So to me, Vucevic offensively looks to be the perfect balance with our bigs offensively. Not to mention a good rebounder. Develop Swan or draft a bruiser second round to fill out roster or in case we need a brute for a couple of minutes vs Cousins or something like that. You don't have to convince me. 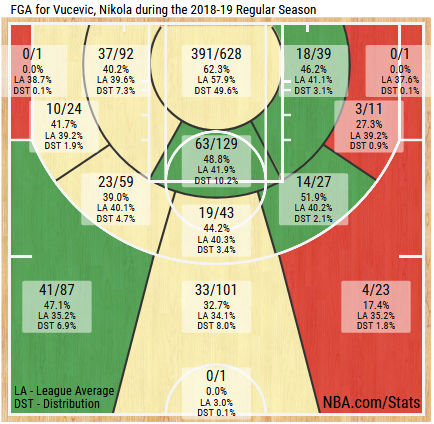 First, Vucevic is a legit center that can body up any center in the league. Neither Bagley or Giles at this point in time can do that. Second, he's a very talented player that can score from just about anywhere on the floor. Third, he's a very good passer, meaning you can run the ball through him out of the high post, similar to how they use Willie at times. He's not just a good rebounder, he's a great rebounder. Lastly, he's a good free throw shooter. Ask yourself, how many games this year would we have won if Willie had made 75% of his free throws. We were one of the worse free throw shooting teams in the league. I believe we ended up 27th. Willie shot 54% from the line. Yeah, maybe it would have made a difference in only a few games, but when your in a playoff race, it's the little things that get you there. Maybe instead of sitting at 39 and 42, were sitting at 43 and 38 with one game to play. Simply because we made a few more free throws. I think Vucevic is a very good fit for the Kings. He's a Swiss army knife type of center. He has a lot of tools available there. I can't really disagree with Joerger bringing Bagley off the bench. It's so rare to find someone that can produce like that off the bench while also bringing energy. Obviously long term he's not a bench player and if they continue to use him that way he'll bail regardless of his MPG but even bringing him off next year could be a good idea. Bagley and Willie are indeed a very poor combination. They don't compliment one another very well and to me that's why it would be wise to move on from Willie this summer. The Kings need more shooting not less and Bagley spending most of his time at the 3 point line isn't the answer long term. If he's at the 3 point line you want to keep that paint clear so he can effectively be in true triple threat position. His face up driving ability all the way from the 3 is where he will be a nightmare for opposing defenses. Agreed, while it's great that Bagley is developing a 3, ideally you want the other big to be the one stretching the floor so that Bagley can work in the post, drive to the basket or be in position to fly in for putbacks. Does Joerger being fired today change the light people see these comments in perhaps? Could he be projecting the locker rooms thoughts about Joerger here? or is he just a self absorbed narcissist malcontent with dellusions of grandeur? I really hope Vlade isn't looking for a coach to believe in WIllie. The guy isn't a rim protector or rebounder which is what the team needs to start off their lethal fastbreak. 30 year old Ed Davis is an elite rebounder. You'd have him over Willie? Whatever Willie brings off the pick and roll and perimeter defense doesn't make up for his lack of interior defense, inability to secure possessions off the glass, and his lack of effort and overall consistency. Consider that as Bagley and Giles develop, Willie's pick and roll play will become less and less valuable, since the offense will rely upon other weapons in the half court. Consider also that if the team wants to win, they will need an interior defensive presence that can help off the weak side when players penetrate, which has happened consistently. Consider also that second chance points have killed the Kings. So with all things considered, a 30 year old Whiteside would probably help this team make a playoff run more than WIllie. We need everything WIllie doesn't do, and we need what he does do well less and less. Vlade knows what a big man has to do to succeed. I don't think he's looking for a coach to believe in Willie. I think that ship has sailed and Vlade will have no problem in moving on from the WCS experiment. If even part of what those rumors about WCS's comments are true, Willie has most likely played his last game in a Kings uniform. 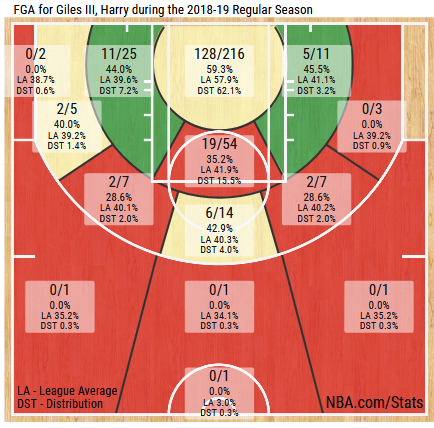 As has been pointed out in another thread, Harry Giles chart is misleading. 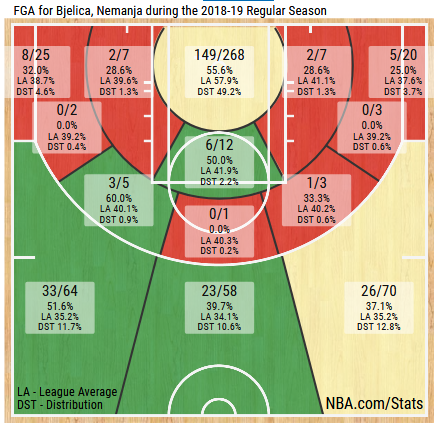 He hasn’t been getting the same opportunities or been used the same with the big club as he was in G-League where he showed the ability to shoot it fairly well. I do think Vlade wants a coach who believes in Giles. If true, then what position does he sign? Are Giles and Bagley our future 5 and 4? Are they our future 4 and 3? I think Vlade goes Center this summer. I still think the target will be Brook Lopez, especially if we get Walton as coach. Neither Giles or Bagley is ready physically to defend the Center position. Giles will take at least 2 years to fill out and be able to play Center full time. I think he looks for a big man that can match up/compete with Vucevic, Jokic, etc. As ockingsfan says above, Giles may be our future 5 but he's not ready yet. I do see Bagley/Giles as the eventual 4/5 but a lot can happen. I truly wish WCS had lived up to the glimpses of talent we saw. Since he didn't and is most likely gone (I especially don't see Walton having any patience with his attitude), Vlade is gonna do his best to find a placeholder center if nothing else. I love Caleb's passion, focus, attitude, etc. but his height and weight are gonna be a real problem. He just isn't IMHO talented enough to make up for those shortcomings. He may be "glued to the ground" but he can move. There were multiple occasions when he was the first one up the court. He might not be able to jump but his screen is also pretty impressive. You want to dry and move him off the block? You'd better have a tank. Yeah I understand your point about weight but I also think Vlade doesn’t want to see Giles glued to the bench. I’m not sure what the answer is but I think Vlade has a vision and it’s not Giles on the bench. I agree that the target will be a C. However, I think Vučević will be our #1 target and if that doesn’t work out, Lopez becomes next in line. Lopez is good for his ability to stretch the floor but his rebounding is a major concern. Vučević would be ideal for this team.